So I wanted to tell you all about this amazing palette that I brought. 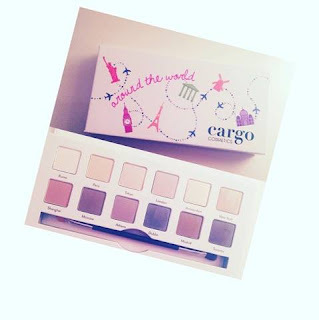 It is the around the world palette by Cargo cosmetics. Before I bought this palette I had never seen this palette or brand before. But let me tell you I am so happy that I saw it in the tk maxx store. The reason why I like this palette soo much is because it consists of 12 beautifully natural shades. And it is perfect to take with you on holidays or festivals as you have every colour you could need for a natural look. The palette is sold for $34 on their website which is roughly £27.42. I love this palette so much because there is 12 shades they are set up as quads so that you can use four shades to get a perfect look. Rome, Paris, Shanghai and Moscow. Tokyo, London, Athens and Dublin. Amsterdam, New York, Madrid and Toronto. My favourite shades in the whole palette are Tokyo and New York because they are just so beautiful. The palette comes with a good sized mirror and it is good quality too. The palette does also come with a double ended brush which is ok but I don't think I would use it and I haven't used it so far because I have better ones. Overall, I think this is an amazing palette and I would recommend everyone to buy it if you are looking for a good sized palette with a range of natural colours that are highly pigmented and high quality.